Curve tracing is a DC verification of the electrical response of a stressed device. For ICs and multi-pin devices, a multi-trace tester allows various power supplies to be applied to selected pins while others are analyzed for their responses. Subtle variations of leakage currents due to damage or stress can often be detected without requiring extensive functional or at-speed testing. Curve trace of power transistor Curve trace of power transistor Measurements of electrical parameters, such as resistance, capacitance, inductance, above or below room temperature, or before and after stress, reveal substandard or weakened components. Measurements can be taken at the external pin level, or within ICs and modules, by micro-probing. Special Pico-probesTM are available when capacitance loading is an issue. 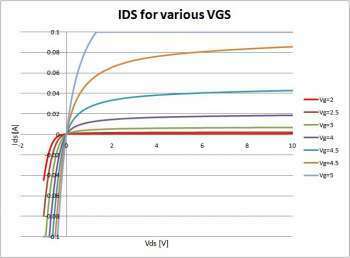 Curve tracing, microprobing, picoprobing, resistance and capacitance measurements, oscillator frequency measurements are all among the electrical tests used in failure analysis, authenticity verification and reliability assessment.